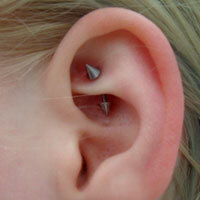 A rook piercing is located just above the tragus on the ridge between the inner and outer conch with the jewellery passing from the underneath to the top of this ridge. 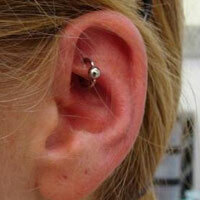 The Rook piecing is made in the cartilage and is sometimes called an Antihelix. Healing times for this piercing can be up to six months or longer and jewellery should not be changed for at least the first 2 months. "Great item, I brought 2 of the purple ones and will defently be purchasing more colours to add to my collection also great service too my items..."
"Fantastic! I buy all of my body jewellery here now and my daughter's, always great quality and always fast delivery. Top place to shop! Thank you."